Yehuda (Duki) Gelber was born on May 4th 1933 in Ede in The Netherlands. Two years later his brother was born. His father worked as an engineer with the "Algemene Kunstzijde Unie". During the German invasion in May 1940 father Gelber took the decision to go to Rotterdam. Ede, he thought, was a garrison-village and definitely there would be fighting going on. Rotterdam on the other hand was lying protected behind the waterline. But he was wrong. The family Gelber went through some scary hours during the bombardment of Rotterdam, but returned safely to Ede after the capitulation of Holland. For now father Gelber could continue his work as the manager of one of the factories of the AKU, but around June 1943, as the supply line of the raw material to the factory stagnated, the family was deported to Westerbork. After half a year the Gelbers left on the first transport to Bergen Belsen. Later they where also part of the 'Lost Transport'. The family Gelber survived the Holocaust, but grandparents, uncles, aunts and cousins didn't return. In Ede the family Gelber tried with the help of the AKU to pick up their life. Father Gelber was transferred for his job to Arnhem. The twelve-year-old Yehuda had problems in school. He was accepted to the HBS, but struggled twice through the first year, and then left the school in the second year. At the age of sixteen he joint the Hachshara* in Gouda and two years later he left on Aliya* to Eretz Israel. He first settled in kibbutz Beth Ha'Emek and then joint the army. 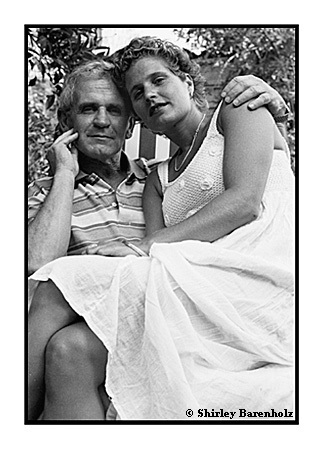 In the kibbutz Yehuda met his wife Mika. Together they decided to leave the kibbutz and Yehuda registered himself for the first tourguide-course in Israel. They settled in Ramat HaSharon and got four children. Today Yehuda enjoys his retirement after being the manager of Isropa Travel for twenty years. He has five grandchildren. Hagit (Pietje) Gelber was born in Ramat HaSharon on June 12th 1967, on the last day of the Sixday-war. She is Yehuda's third daughter. A seven years younger brother closes the ranks of this six-headed family. After her high school Hagit served in the army as a producer with ‘Gale Zahal’, the army radio station. After the army many activities followed in which Hagit was searching for her place in Israeli society. First she left for nine months to Europe and New York. Back in Tel Aviv she worked for a while in restaurants and bars, after which she and a friend opened their own little restaurant: ‘Hagit's Corner'. The restaurant was doing well, but because of problems with permits they had to close after a year. In October 1991 Hagit moved to Florentine, the 'Soho' of Tel Aviv. Her next step brought her to the Academy of Dramatic Art of Yoram Levinstein. But after a year she left. In 1995 she travelled abroad again and was sailing for three months along the coast of South America and through the Caribbean. After she returned to Israel she worked in bars and restaurants again to support herself financially. In August 1996 she left for India, but after three months she got very sick and had to return home. After she completely recovered she picked up her life again and worked in the weekends in a 'trendy' nightclub and during the week in a restaurants around the corner from her house. Before Hagit anticipated in the project 'Children of Hope' she had already began photographing in her spare time. In February 1997 I stepped into Hagit's life and for a week we worked on her chapter. This evolved in an unexpected continuation: in August 1997 Hagit came to Amsterdam to photograph a chapter about me. At the moment Hagit is living in Amsterdam and she is working with me as a personal assistant. Yehuda (z”l) 4/5/1933 - 16/4/2010. Yehuda passed away three years ago. He is a grandfather of twelve grandchildren. Ein Hod. (See also the documentary ‘open Eye – open I’). this transport, and it took months before repatriation began. strenuous task that lay before them.